I recently discovered Reply All, which is a podcast that explores interesting and amazing stories about the internet. I've been listening to past episodes and today I discovered Episode #2: The Secret, Gruesome Internet For Doctors, which focuses on the existence of an app for doctors called Figure One. Figure One is essentially an Instagram of gruesome photos of bodily diseases and injuries posted by doctors, potentially for educational purposes but mostly just for story sharing. What's really interesting about this app is how normal it seems to doctors and how abnormal/gross/scary it is to everyone else. There are professions, like soldier or doctor, that deal with death and the fragility of life on such a regular basis that it becomes normal to them. This creates a disconnect between what feels normal to a doctor and what feels normal to a patient. The doctor has faced the absurdity of death in a way that the rest of us try to remain ignorant of. Good doctors use empathy to bridge that gap. They can't go back and unsee the things they've seen but they can try to understand that a patient doesn't have that same experience and doesn't want to have it. We, the pool of potential patients, survive by not worrying constantly about the 100% likelihood of our eventual demise. That blind optimism about our own moment-to-moment immortality is actually very similar to how most people view (or want to view) relationships. 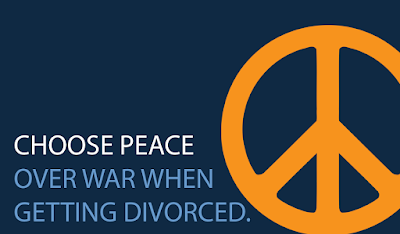 As a divorce mediator/attorney I deal constantly with the death of relationships. Like a doctor who may see thousands of different ways that people can die, I spend my days dissecting the remains of broken relationships. For many divorce attorneys and mediators that familiarity with the end of relationships becomes our normal and can callous us to the raw emotion and loss that people feel at the end of a relationship. This disconnect was highlighted for me recently when I heard about and visited the webpage for the Museum of Broken Relationships. While many would see these exhibits as something sad or perhaps cathartic, my first reaction was that of a clinician, wondering the legal status of the personal property on display. As I thought about it more, though, I was curious about what my clients would put in the museum. Did I know any of them well enough to guess what the symbol of their break up would be for them? Would asking them to think about that be helpful or too painful? The Secret, Gruesome, Internet for Doctors and the Museum of Broken Relationships could both be viewed as cold reminders that all things come to an end, and if that's all they were then the only interest would be from clinicians or those with a morbid curiosity. However, there is a benefit to collecting reminders of pain in one place and putting them on display. Anything can become normal if you deal with it enough, but reminding ourselves of that makes us a little uncomfortable. It reminds us that we weren't always jaded. Knowledge of the underbelly of life doesn't mean you have to lose the capacity for hope and empathy. In fact, a practitioner who knows the worst that can happen and still has hope is the best possible model for a person in pain. When I teach mediation, I tell students that there are two important traits the mediator should bring to the mediation. 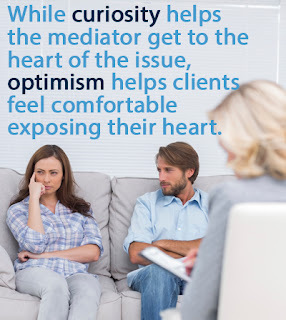 In addition to the skills a mediator must learn to help clients resolve their disputes, mediators must be curious and optimistic. While curiosity helps the mediator get to the heart of the issue, optimism helps clients feel comfortable exposing their heart. Even when people believe there is no way they can resolve their dispute, the mediator's belief that it can be resolved keeps the door open, and gives the clients hope. Patients and clients might hire you for your experience or your knowledge, but they can't succeed without hope. "Darkness cannot drive out darkness: only light can do that. Hate cannot drive out hate: only love can do that.” - Martin Luther King, Jr.